Open woodlands are biologically highly diverse habitats and veteran (i.e. old, senescent) trees are key structures supporting their biodiversity. Open canopy structure had been maintained by both natural and human induced disturbances. In the past two centuries, suppression of such disturbances, together with forestry intensification, has turned most lowland woodlands into closed-canopy forests. 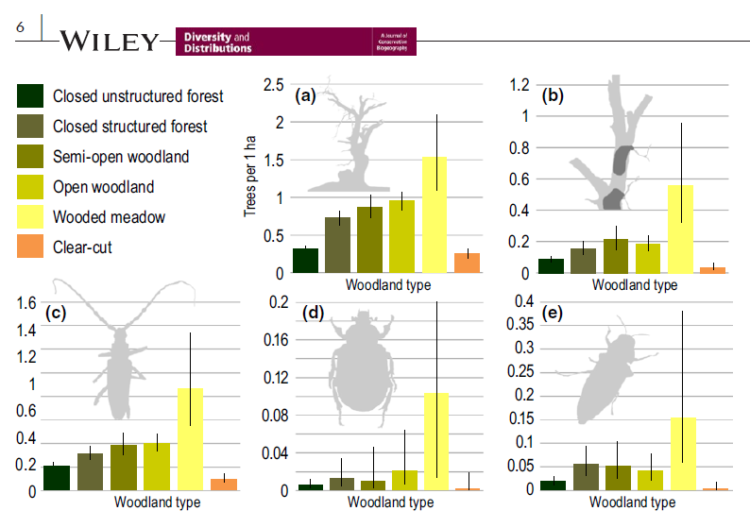 We investigated the effect of increased canopy closure on veteran trees and several threatened beetles associated with them. Floodplain woodlands along the lower Dyje and Morava rivers, Czech Republic. We used an approach combining the study of aerial photographs with on-ground survey of veteran trees and associated endangered beetles. The aerial images were used to obtain the information on historical (1938) and recent (2009) canopy closure in the area of 146 km2, where we mapped large oaks (DBH > 70 cm), hollow trees, and three associated beetles including the hermit beetle (Osmoderma barnabita), the great capricorn beetle (Cerambyx cerdo), and the jewel beetle Eurythyrea quercus. The presence of large oaks, hollow trees and their associated beetle species are negatively related to recent high canopy closure, and the historical level of canopy closure matters as in nowadays closed-canopy stands the beetles and veteran trees are more common in places that were rather open in 1938 than in the places with closed canopy already in 1938. Moreover, the health state of veteran trees highly depends on the canopy closure. The negative effect of canopy closure on veteran trees and their endangered inhabitants is several decades delayed and may thus often go undetected. In the forests, however, large and hollow trees and their associated biodiversity are relics of the past, more open conditions. The restoration of open woodlands is therefore vital for preventing their further decline. Conservation management planning needs to take this into account wherever veteran trees and associated biota are concerned.